Instant Car Donation was founded with the goal of bringing donors and local charities together with an efficient and pleasant process. You can focus on deciding which of our respected charities is right for you instead of worrying about difficulties of researching how to make a donation. After your free pickup, we will assist you in recieving the best tax benefit possible for your generous gift. We take pride in helping smaller charities easily receive car donations, bringing people together while helping support those in the Lawrence, Kansas community who need it the most. Here are some of our favorite charities in the Lawrence area. We have made sure each of them are eligible for tax deductions when you help your local community by donating your car. Your values and choice can make a difference. The Kansas University (KU) Alumni Association exists to strengthen the University of Kansas by informing, engaging and mobilizing the KU community. The Association's vision is to be a consistently growing, active and powerful KU community that creates impact for the University. The KU Alumni Association provides programs and services to engage and mobilize students and alumni, who are the most vital resources for a greater KU. The Topeka Rescue Mission is a homeless shelter which has served Topeka, Kansas for more than 59 years. TRM is dedicated to providing food, shelter, clothing, training and hope to homeless and impoverished men, women and children. In 2011, TRM sheltered 2,201 different people and provided more than 524,585 meals. Founded in 1986, the mission of the United Way of Douglas County is to address human service needs by mobilizing community resources and building partnerships. United Way of Douglas County's Center for Human Services provides a campus-like atmosphere for the 20 nonprofit organizations that occupy its low-cost offices. The organizations thrive by being able to share resources, office equipment, conference rooms, storage space, and information, and it is through this kind of collaboration that the United Way of Douglas County takes another step towards strengthening local human services. For more than 80 years, United Way of Greater Topeka has been improving and changing lives. It began during the Great Depression when a local Community Chest was founded to bring hope and prosperity to the community. Through recessions and depressions, in times of peace and war, and during local disasters, United Way and its partners stepped in and rose to the challenge. The United Way of Greater Topeka creates positive sustainable change in our community. There are many charities in your Kansas area which could benefit from your car, such as your Dodge Journey, donation. We not only assist you contribute to a charity, but we also focus on providing an easy means to regional non-profits that are small they can focus on their work that is important to accept donations. The donation will make the difference for charities, while helping support those in their Kansas community who want it the most bringing together individuals. Car donations are the most fiscally accountable method for many people to create a sizable contribution. Due to this, one of their aims is to empower those making a choice that is benevolent by making sure that the automobile, like your mycar CV .2, goes to the charity which best reflects their values. We always make charity choice an essential part of the procedure, when donating together with us. If you would like us to pick which charity would benefit the most we can do this. It's necessary to Instant Car Donation that you get the largest tax deduction advantage without needing perform research or to navigate complexities possible. We pre-qualify all of our charitable institutions that are engaging would be tax deductible. The process will be streamlined for both you and the charity of your choice. We will help you with a 1098-C tax document following your donation. Aside from the charitable tax benefit rather than getting the hassle of managing an older car, the feeling of having the ability to assist those in need might be the best reason to donate your car to a charitable institution, such as Kansas University Alumni Association. When you opt to create a donation of a old automobile, like your Isuzu Hombre, when the non-profit organization sells the car to get more than $500 they have to send you a receipt that lets you deduct the sales cost of the vehicle on your own tax return. If the old car you made a decision to donate is not worth at least $500, then the IRS lets you determine the fair market value. This is the value that someone would be prepared to pay for the car in Lawrence if purchasing it from you. To be able to receive the tax deduction, so you will have to itemize your deductions on your tax return. As a result, you get out by eliminating your used car, truck, RV, motorcycle, or other car, without having to market it in Lawrence. You receive the tax benefit, along with the charity gets to utilize the car, such as a Mercury Mystique, sells it and uses the proceeds for the good of the charity, for example United Way of Douglas County. That's a wonderful thing for everyone involved. Car donation programs are becoming more popular in Kansas over the previous decade or so, as more charities are searching for new and innovative ways to generate funds. Nowadays, the amount of charitable vehicle donation programs numbers in the hundreds or perhaps thousands. When you've got a favorite Lawrence charitable institution, for example Kansas University Alumni Association, you prefer to make donations to, it is probably possible for that charitable institution, for example Kansas University Alumni Association, to get at least a part of the funds when you give your old vehicle. Most old automobile donation programs will either sell the vehicle to raise funds for your reason, utilize the vehicle, such as a Opel Ampera, in the everyday operations of the organization, or provide the vehicle, like your Hyundai Pony, to a someone from Lawrence who needs help either for free, or even for under the fair market value. One more advantage of donating a used auto to charity would be your opportunity to just eliminate the automobile, like a Porsche Macan, without having to try to repair or promote it. Most charitable vehicle donation programs will except vehicles if they're operating or in need of repair. Some cars or trucks that are beyond repair will probably be sold for parts or waste and any cash received will go to the charity. While there are numerous benefits to charities that receive donations from people, the benefits to the you, the donor may not be as clear. The biggest advantage which the majority of people hear about is the chance for a tax deduction. There are a few limits on this kind of deduction, so you might want to talk to a tax pro before making the donation. Charitable car donation programs allow you to donate your secondhand car to the charity of your own choice. Visit our charities page to find a charity in Kansas to contribute to. Is there a tax benefit for donating my car or truck in Kansas? We can guarantee your car goes to a non-profit organization, for example Kansas University Alumni Association, that's eligible assist you recieve a reciept for your contribution and for tax deductible donations. You might be able to have a tax advantage should you itemize your deductions. For donations around $500 you're able to use Kelley Blue Book and for larger contributions the charity must verify what they recieved to the automobile donation (more information). 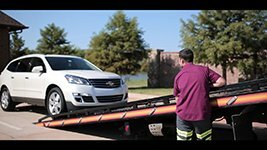 We will arrange a tow truck to come pick up your vehicle and send it to the non-profit organization of your own choice. It couldn't be much easier now to help your charity of your choice! Do you take donations for cars and trucks which are damaged or lost parts? We accept vehicles in all states! Go to the form and ask to donate, and we will quickly see what we are able to do for you. Can you help me find a non-profit organization that is suitable for my personal morals? We'd really like to assist you make sure that your donation goes to your cause in Lawrence you care about by helping you choose a non-profit organization, for example Kansas University Alumni Association, that fulfills your values. This is important for us we do so each time you contribute with us! Who can I donate my vehicle to in Lawrence? Instant Car Donation proudly supports many respected local & national Lawrence organizations in the local area. We work hard for you to guarantee maximum support is recieved by the organizaion for your vehicle. How do I prepare my Kansas DMV documentation? All owners on the car title must finish the section of the title labeled "assignment of title by owner" or "transfer of ownership by seller". The majority of states require signing and printing owner names. You should fill out any areas that need information about a buyer/purchaser/transferee with information about who you're donating the car, such as a Jeep J-20, to. Instructions may be found by you here. First we will get in touch with the non-profit organization, for example United Way of Douglas County, of your choice (or select one for you if you asked that rather than picked) to make certain they need your own automobile, like a Buick LaCrosse, which takes about one business day. Wewill arrange for a tow truck to come for you for pickup. If it's taking a little more time feel free to give us a call. Attempting to choose whether or not to contribute your car? While donating a car, such as Ford Five Hundred, is a great way to receive a tax-deduction, the advantages of donating your car in Lawrence go beyond tax season. Donating a car makes a true difference for charities, that are searching for creative ways to increase their impact on local communities. It may not look to be a automobile donation could really affect the bottom line of a charity, like United Way of Douglas County, that considerably, however if we take some time to actually examine the situation of most small and medium-sized non-profits within our regional community, we'll most likely discover they are all doing their very best to serve the largest number of people, however with very limited ways. Take the instance of United Way of Douglas County in Lawrence, Kansas, a small neighborhood non-profit. Like every tiny non-profit, it is always searching for ways to improve its contributions so that it may provide additional solutions to its target community. Though a lot of large nonprofits, like Jack & Jill Children's Center, have paid staff that could receive and sell a given car to boost help increase its revenue, a small non-profit like Kansas University Alumni Association might not have the staff to accept a vehicle and process your contribution of a Isuzu IMPULSE. We can help! We work together with charities to be certain they all have the ability to receive a car donation. By clicking the donate button, and donating your vehicle to a small business in this way, you supply them with the chance to receive unforeseen funding which may extend the length or reach of a current job, or to even launch a new job that would have been impossible without the donation. We are going to arrange a complimentary pickup in Lawrence and organize to sell your vehicle. All you want to do is tell us about the car you want to give, such as a Acura Vigor, and decide on the charity you wish to help many. We are linked to a community of tens of thousands of charities already, and have the capacity to reach out to almost any charity for your benefit. Our intention is to provide needed funding to all those charities that are doing important work in our communities, but have limited funding and staff. So, what are you waiting for? Click the contribute button today and let's put your vehicle donation to work for all our community! If you make the choice to donate your car, like a Alan Autosports Gt Malan, to support a cause that you care for, you recieve the benefit of a tax deduction - and the charity like Self Enhancement, Inc. receives the advantage of the funding to host programs or projects. But were you aware your car donation may provide the advantage of greener living throughout recycling? Recycle, reduce, and repurpose are all conditions we are extremely familiar with these days. We want to take care of our environment and reduce our carbon footprint, and save the planet for future generations at Lawrence. We take the time to sort our recyclables into steel, plastics, aluminum and paper. But in case you ever think that automobiles were a part of recycling? And, the majority of us don't have enough time or energy to fix up our cars so that we are able to sell them and fetch the highest price for what we have. That's where we come in. If you donate your vehicle, we arrange a free pick up and sale of your vehicle at a local market in Lawrence. In the auction, your car will be bid on by a person, used car salesman, or mechanic that wishes to give your automobile new life, and has skills and time to perform it. That is to say by donating your vehicle, you are in fact giving it a new function! Who understood that donating a vehicle could attain so many crucial goals simultaneously? When we donate a car, we gain a charity like Amigos For Kids by providing them much-needed funding, take the load of fixing up the car from ourselves and we repurpose and recycle our vehicle! Can each charity deal with the job it requires to process a car donation? Regrettably, no. Take the instance of United Way of Douglas County in Lawrence, Kansas. United Way of Douglas County may not find sufficient efficiency in managing the towing, titlework and selling of a donated car. And hence, United Way of Douglas County might not be able to rely on automobile gifts as a source of funding. But during our streamlined procedure, funding from the selling of your car can really make a difference for non profits like Kansas University Alumni Association. We can lend charities such as Food Bank for the Heartland a hand while a more joyful, more simple life. There are a number of reasons people donate cars, like being a Tesla Model 3. A number of us do not have the time or inclination to market a car that's simply sitting in the driveway or the garage. Many others of us do not have a great deal of cash on hand to encourage our preferred respected charity in Lawrence, also that is our opportunity to try to accomplish something big to encourage their important job in the community. Along with these factors, a fantastic many men and women contribute ELVs, otherwise known as End of Life Vehicles. Once we get older ourselves, or even face the passing of our family and nearest and dearest, donating a car such as a Infiniti Q45 into the charity of our heart is a gift that we will give ourselves and our community at Lawrence or our community area. We may have gotten to this point in our lives where we simply aren't driving our car any longer. What better use will we make of our car in place to use it to impact our community? Particularly small and medium nonprofits like Kansas University Alumni Association in Lawrence, Kansas, really depend upon the support of this community to carry forward their work. Should we choose to give our car to a charity like United Way of Douglas County, whose assignment we truly believe in, we provide them the gift of unexpected funds to support an current program , or to help them develop new programs and also extend their own outreach. Donating our car may be gift we give ourselves. Many of us are also in the position of care for their estates of their loved ones and putting their last fantasies into action. In this case we would opt to donate their car to a reason they really believed in during the course of their life. Allowing them to donate their car can be a gift we give them. No matter why you're considering donating your car, we will help. The point that seems most significant to people considering donating their car or truck is to ensure the donation would go into a charity they really have confidence in, such as Jewish Federation of Greater Des Moines. We have achieved to thousands of charities in Lawrence and outside, whose titles and profiles are around our website. We partner together to ensure that they are able to accept your auto donation. Additionally, if there is really a charity you want to subscribe to who isn't listed here, then we are willing to contact them for you personally on your own benefit. We will arrange a free pickup of your vehicle, assist you to transfer your title, and also contact the non-profit of your own choice, such as Shoes and Clothes for Kids, to ensure they receive your donation. We will even ensure that you have the paper work that you need come tax period to get the maximum tax donation. When you contribute a car, like a mycar CV .2, you can contribute from the center. There are several worthy charities out there that are in need of your aid, especially in Lawrence. Take United Way of Douglas County in Lawrence, Kansas. This a excellent illustration of a charity that touches the lives of so many in the neighborhood community. We can not do the work that United Way of Douglas County does, however, we can all lend a hand to empower and further its mission. Do you have a car in need of a new home? Before you click on the donate button, take some time to check through the many pages of charities, such as Shoes and Clothes for Kids, that we partner with. Which of them speak to your heart? Then take a little time to reflect. What dreams do you have for the people of your community? After that, imagine how by carrying an action as little as donating your vehicle in Lawrence, you're in a position to help make those wishes come true. Imagine what chain of events your car donation might set off in Lawrence and outside. Do the fantasies you have go past the pages of our website? Probably. We must all dream large, especially when it concerns the good wishes and happiness that people make for others. But some us of might find that the charity we all wish to donate our automobile to isn't listed on this website. We can help! You can still click the donate button and then let us know that there is a worthy charity, like Cradles to Crayons out there which that is not listed on our site. We'll get that charity and use our resources to make certain it is able to get your donation. The approach is straightforward. Once you click on the donate button and let us know you are prepared to give your car, such as a Aston Martin Vanquish Zagato. We'll organize a free pick-up for your vehicle in Lawrence or the neighborhood area, and listing on the auction to acquire the maximum price possible so that we could make the utmost donation possible for your charity of your choice, such as United Way of Douglas County. Not only will you get to donate your vehicle from the heart, but you're also qualified for a tax-deduction. We will finish your tax receipt and offer the non-profit with needed IRS paperwork in addition to your contribution. Giving from the heart could not be easier!